Yesterday, The Clarion project brought us "Perhaps the Most Barbaric ISIS Execution Video Ever." The message of those who are behind these barbaric acts, namely the "New World Order" minions, is "Submit to Islam or else!" On April 8, 2016, representative for California's 43rd district, Maxine Waters, implied that Americans are bigots for opposing sharia law." Chancellor of Germany Angela Merkel, "Time" magazine's 2015 "Person of the Year," was responsible for slapping the German flag and saying "Islam belongs to Germany." She knows exactly what she is doing by opening the flood gates to illegal Muslim immigrants, and said, "Refugees had not brought terrorism to Germany." She is right, she did. On December 22, 2015 it was reported that "Germans concerned They've Lost Control of Muslim Invaders." On the 28th, a headline read, "Muslim Refugee's set on Fire man Sleeping on Bench in Berlin." The list goes on and on_. Headline News: December 27, 2016 "Refugee Admissions Surge 86% Year on Year: Ahead of Trump Inauguration, Obama Rushes Muslim Refugee's Into US." Ever since September 11, 2001, it has not ceased to amaze me the lengths that corruption in American government, along with the use of the "Useful idiots" in the media, have gone to use fear as a tool to oppress and control the American people. "You can get people to do anything with fear." After September 11, 2001, Condoleezza Rice said, "The system of terror was essential to Stalinism_ Terror was the creation to mold politically the control that they wanted." Oxford English Dictionary defines "terrorism" as "Government by intimidation." New World Order, "Terrorists are just people who reject the New World Order." 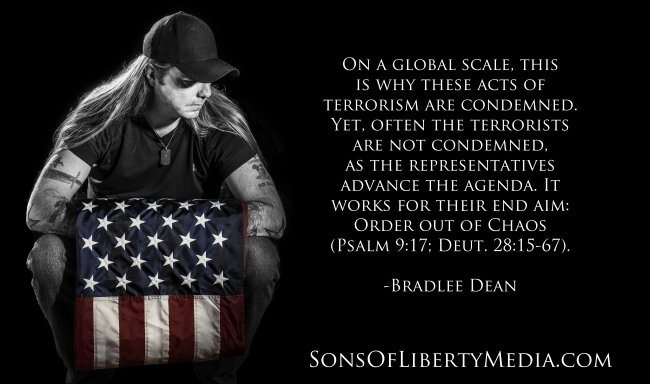 Have you taken the time to see what the corrupt in your government has deemed a "Terrorist"? *Those that are interested in "Defeating Communism"
*Those concerned about "Illegal Immigration"
On December 26, 2016, Barrack Hussein Obama signed and illegal "Ministry of truth" bill. The truth, according to their wicked minds, is what they say it is (Isaiah 5:20). Operation Northwoods: In the early 1960s, American military leaders drafted plans to create public support for a war against Cuba, to oust Fidel Castro from power. The plans included committing acts of terrorism in U.S. cities, killing innocent people and U.S. soldiers, blowing up a U.S. ship, assassinating Cuban emigres, sinking boats of Cuban refugees, and hijacking planes. The plans were all approved by the Joint Chiefs of Staff, but were reportedly rejected by the civilian leadership, then kept secret for nearly 40 years. Maybe Americans should take the time to see the history of Islam, which was used to help establish "Nazism" or a "New Order" (Hosea 4:6). History shows that Hitler worked with the Muslims to do his biddings for him, in order to eradicate anyone that would "dare" stand in his way, or should I say his "political opposition." Or perhaps, Americans should take the time to see that Prescott Bush's father (American banker, Wall Street Executive, Treasurer for the first national capital campaign of Planned Parenthood, Senator for Connecticut) to George Bush Sr. and grandfather to George W. Bush was indicted in 1942 for "trading with the enemy" (2 Corinthians 11:14). If Americans would simply turn to their forefathers, who were called "Terrorists" by a tyrannical King in England, maybe they would clearly see as to what is taking place this country today. Read what could be called the preamble to the United States Constitution. the Declaration of Independence. Maybe Americans will come to the realization that those who have been calling these things conspiracy theories are the one's helping cover for the conspirators (Jeremiah 11:9).